Congratulations on creating an interactive art project! The videos below will show more functionality you can add to your project. Feel free to explore on your own as well. In Cool Effects, you will change the character sprite's looks based on the mouse pointer's position. you will add background music the project. 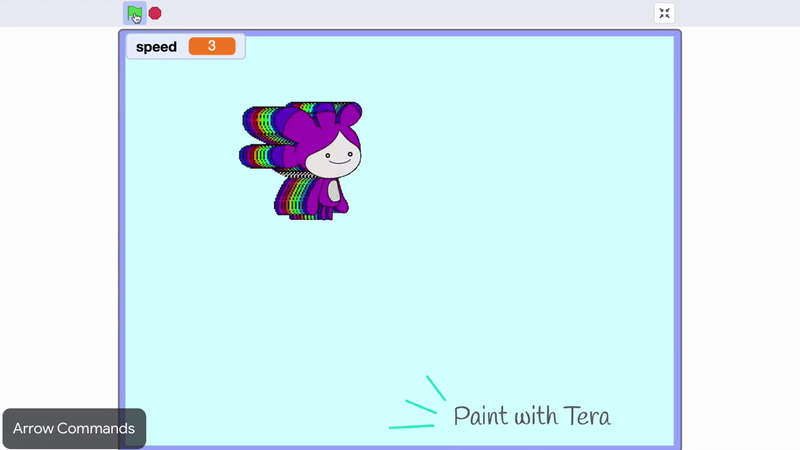 In Tiny Tera-Giant Tera, you will use arrow keys to make Tera grow and shrink on command. In Arrow Commands, you will make the sprite move using the keyboard instead of the mouse. Create another sprite that can collide with your character sprite in Collision! In Wardrobe, you will add your own costume to your sprite. Choose the add-ons that interest you. Then show off your awesome project to your neighbors and see what they create with it. Change the the character sprite’s looks based on the mouse pointer’s position. Add background music to the project. Use arrow keys to make Tera grow and shrink on command. Make the sprite move using the keyboard instead of the mouse. Create another sprite that can collide with your character sprite. Add your own costume to your sprite.